A Darkness of Dragons (2018. 293 pages) is a delightful fantasy novel from S. A. Patrick. The story tells of a young lad, who is naturally good hearted, a nice reflection on a story which is all about having heart and courage. Although Patch is undoubtedly talented as a piper, he has a likeable, humble personality, which makes those he meets on his journey, and the audience, like and care about what happens to him. Patches world is the usual faux medieval setting, but rather than the grime and violence seen in many fantasy novels, this book takes us back to the settings of our own favourite children’s tales. Patch is, or was, a piper, someone who can use magic to influence both man and beast; greater pipers can even make sounds which will knock a dragon out of the sky. Other, more mysterious, types of magic are to be found with the witches and wizards. In this world, two dominant species exist. On the one hand, there are the humans, but within flying distance is the realm of the dragons, intelligent creatures, who view the pipers with more than a little enmity. The source of this rift is the Piper of Hamelyn, a man whose heinous crime saw both human and dragon children being carried off. When the dragons demanded the piper of Hamelyn’s head for the crime, the pipers refused, hoping that one day he would admit to the crime and say where the children of two races had disappeared to. He is held in such contempt that following his crimes “The Dance”, the song he had played to carry the children off was banned for evermore. It is now considered one of the most shameful parts of the piper’s history. Now, there may be those who would look on an amnesiac piper playing “The Dance” with some sympathy, especially as his intentions were good. Unfortunately, things do not go so easy for Patch. I don’t really want to spoil the book's plot, suffice it to say that Patch has to go on a journey, to join with new heroes and meet old ones. He also discovers a deadly secret, that the evil Piper of Hamelyn may well be still alive and out in the world somewhere. 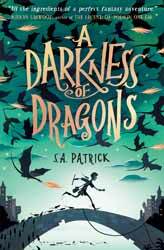 To aid him on his journey he meets Wren, a young girl who has been cursed to live as a rat and Barver, a Dracogriff, a fire breathing half dragon, half Griffin. There is something endearing about all of the main characters. Patch is very honest and earnest, Wren, is brave ad fearless, Barver, is the perennial fish out of water, but, the characters not only complement each other, in very important ways they complete each other. The book's chapters are the right length if you are looking for a book to read to children at night. There is action and mild peril, but nothing which will overly disturb, the story being pretty much suitable for all ages. I would also recommend this for adult readers who are looking for a little slice of fantastical wonder in an otherwise bleak world.